The Inwood Dance Company was established by Winston and Denna Smith in 1990. This non-profit organization meets the needs of pre-professional students ages 11-18 for a higher dance education as well as those aspiring professional careers. In 1991 the company became West Virginia’s only member of the Southeastern Regional Ballet Association, an honor only bestowed through the highest technical standards. This prestigious organization has help emerge the Inwood Dance Company as one of the top regional ballet companies in the Southeastern United States and being promoted to honor status in 2008. This spring the IDC will participate in RDA’s SERBA Festival in Montgomery, AL May3-5. Visit for more information. Belonging to SERBA, enables dancers to take classes with famous teachers, learn repertory of top choreographers and have the opportunity to earn scholarships to professional dance schools and colleges. Many IDC members have continued their dancing professionally with companies such as the Pittsburgh Ballet Theatre, Houston Ballet II, Louisville Ballet, Richmond Ballet, Colorado Ballet and Gus Giordano Jazz Dance Chicago. Three of the IDC ballet’s have been honored by placement onto the National Choreographer List 8+1, Port of Call, and doublespeak . The Inwood Dance Company provides a professional environment to nurture young dancers with a strong classical foundation that supports the newest contemporary choreography. Our professional faculty includes Director, Denna Smith, a member of the Royal Academy of Dancing and Susan Banks, professional dancer with the Houston Ballet. Professional guest artists and choreographers are continually invited to enhance the dancer’s technique and performance including Shan Dai-National Ballet of China, Lauri Stallings- Glo-ATL, Katrina Killian-New York City Ballet; Jenny Chiang- Northern Ballet Theatre, Eddy Ocampo-Level Dance Chicago and Laura Alonso – National Ballet of Cuba. Students are prepped and encouraged to attend top summer schools and academies across the United States. 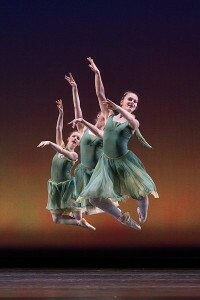 Students have attended School of the American Ballet, Houston Ballet, Boston Ballet, Atlanta Ballet, American Ballet Theatre, North Carolina Dance Theatre, North Carolina School for the Arts, Universal Ballet Academy, West Virginia Governor’s School for the Arts, Central Pennsylvania Youth Ballet, Pointe Park College and Virginia School for the Arts. Our students have received over $450,000 in scholarships from professional schools, colleges, SERBA and the Marion Park Lewis Foundation. During the summer of 2001 eight company members performed and toured China by invitation of the Minister of Cultural Arts in Qinhuangdao. This cultural experience brought together people of two great countries through their mutual love and respect for the arts. Education is a big part of the Inwood Dance Company mission and this season’s outreach programs will include a Week with the Masters Workshop in August and The Nutcracker Performances for elementary schools in December.